Oil on canvas, 36 x 52 cm. A group of beech trees rise majestically atop a hill in a densely wooded forest. A toppled tree occupies a central position in the foreground, while grey clouds fan out over an otherwise bright sky in the background. The beech tree became a central symbol of Danish nature and patriotic sentiments in the 1800s and was included by Danish poets in patriotic songs such as the national anthem Der er et yndigt land (1819) by Adam Oehlenschläger and H.C. Andersen’s I Danmark er jeg født (1850). P.C. 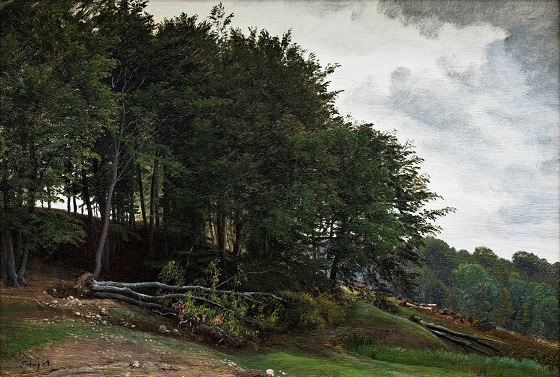 Skovgaard’s bright and harmonic depictions of the Danish beech forests also betrays a nationalist sentiment. In this painting for example, the toppled beech tree is featured as a central component in the composition. In 1864, the same year Skovgaard completed this painting, Denmark suffered a massive blow to its national pride and identity when it was forced to cede the Duchies of Schleswig, Holstein and Saxe-Lauenburg to Prussia and Austria.